The common names of K fish can be a lot of fun; they include keyhole fish and even kissing fish. The reality, however, is that choosing fish for your aquarium community has nothing to do with the first letter of their common names. Instead, pay close attention to their family names which will tell you much more about the fish's size, shape, behaviors, and likely personality. For example, loaches are peaceful bottom-dwelling scavengers; you can make a good guess that any loach would do well in a community tank. Cichlids, however, are an incredibly diverse family; some are much bigger than others, some are aggressive while others are peaceful. Here is a list of common fish names that begin with the letter K, cross-referenced to their scientific names. This list is not comprehensive, but it does include some of the most popular aquarium fish. Kafirnigani Gray Loach (Triplophysa dorsalis kafirnigani): Usually living in lakes and water with slow currents and river coves, it likes quiet water or dense weeds. The Triplophysa genus is found primarily on the Qinghai-Tibet Plateau in China. Katangae Nile Bichir (Polypterus bichir katangae): This species has been found in lakes, rivers, and marshes in Egypt, Nigeria, Kenya, Ethiopia, Ivory Coast, Cameroon, Ghana, Chad, and Guinea-Bissau. Keep a lid on this fish in an aquarium as it's the Harry Houdini of fish and loves to escape. While it's an essentially peaceful species, it can't be trusted with tank mates it can fit in its mouth!. Kenyi Cichlid (Pseudotropheus lombardoi): This is a gorgeous zebra-striped African cichlid. Originally found in Lake Malawi, it is a moderately large and aggressive fish. In its natural habitat it can grow up to 5 inches, but it can get even bigger in an aquarium. Keyhole Cichlid (Cleithracara maronii): This is one of the most peaceful cichlids, and it's a shy and reclusive fish that makes a great tank mate in any community. It is tall in relation to its length and sports an oval-shaped, short body, and round forehead. Kingsley's Ctenopoma (Ctenopoma kingsleyae): This fish is a predator in nature; while you don't need to feed it live fish, it does require meaty food. It is best to keep it alone or in a pair, as smaller fish will become a snack. 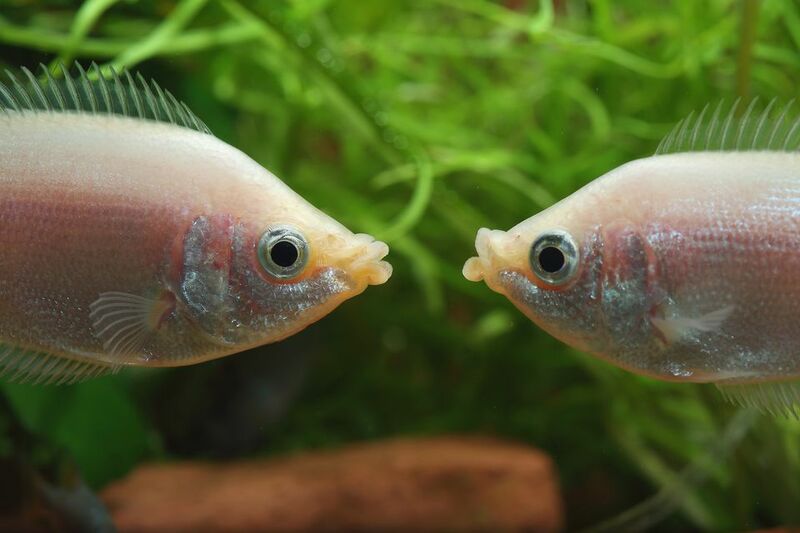 Kissing Gourami (Helostoma temmincki): Also known as the kisser fish or pink kisser, the kissing gourami is a silvery peach color and boasts thick lips that it extends or purses, appearing to kiss. It is generally a peaceful fish, but males may sometimes fight by pressing their lips together. The weaker fish will usually back off. Kiver (Lepomis gibbosus): These are not a good choice for community fish since they will eat smaller tank mates. They are tough and belligerent and can be very destructive as they get older. They are known to rearrange the tank, tear up plants, and break heaters or thermometers. Keep equipment protected and out of reach. Kner's Banjo Catfish (Dysichthys knerii): Don't keep this fish with smaller ones as it will eat anything that goes by. It prefers worms and will jump out of the gravel to catch one, then burrow back under the gravel to eat it. Knight Gobie (Stigmatogobius sadanundio): Knight gobies are territorial and will defend their space. They need lots of places to hide in an aquarium, like caves, plants, and driftwood. If you keep more than one, be careful as they are aggressive towards their own species. A 20-gallon tank will suffice.